built with brick. The old Ogden Schoolhouse. have become private homes. Hamlin #1 was even more unique. Did you know that you could still see many of the old “common” (or elementary) schools that students attended throughout the county? 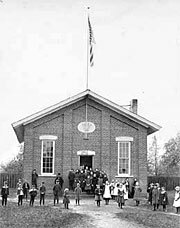 The first school, District #1 in Northfield (now Pittsford), which opened in 1794, began decades of rapid growth in the number of schools and students. Most of these schools had one or two classrooms and teachers and served students ranging from kindergarten to adolescence. Until the creation of the state school fund 1805, the schools were completely funded by parent subscription, based on the number of students per family that attended school. Each “district” (as the area each common school served was called) elected three trustees to administer its schools and the state funds it received. The Central Rural School Act of 1914 provided funds to centralize districts beginning in 1925. In 1924, just before centralization began, there were 185 districts throughout the county; this had dropped to 161 in 1945, and was down to 44 in 1954. Centralization continued through the 1950s and gradually eliminated the one room schoolhouse from our education system, but not from our landscape.